When you launch Spotify Mobile, you sign in with your existing Spotify username and password, of course. If you don’t have one, you need to follow the link to sign up! 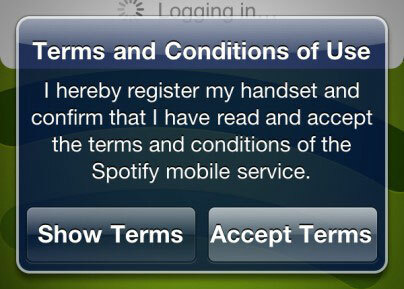 When you log in and use your handset for the first time, you also need to confirm that you accept the Terms and Conditions. Because all your Spotify playlists are stored in the cloud (meaning they’re hosted remotely, accessible over the Internet), as soon as you accept the terms and log in, you see those playlists instantly appear in the app’s Playlists category. If you’re logging in with a basic Free account, you can’t play these tracks unless you own them on your main computer and sync them to your phone. But those of you who are lucky enough to be Premium subscribers can start streaming tracks straightaway from Spotify’s library. Please make sure that when you stream tracks, you keep an eye on the data you’re downloading, particularly with your mobile data plan, so that you can avoid excessive data charges. Spotify recommends connecting to a local Wi-Fi Internet connection by using your phone and syncing your playlists so that you can listen to songs in Offline mode whenever possible. After you have Spotify on your mobile, what about the rest of the family? Can you stick it on their handsets, too? You can log into Spotify on any number of devices by using your account, but only one of these devices is allowed to actively stream music at any one time. However, Premium users can sync up to 3,333 tracks from Spotify’s library for offline listening on up to three different devices (including your computer). Spotify has yet to issue a family-type subscription that offers discounts for members of the same household or increased privileges that allow streaming from more than one account at a time. To play different music in several rooms in the house, you’re limited to options such as using one of the multi-room streaming solutions. Family accounts are one of Spotify’s most-requested features, but licensing deals are complex and would require renegotiating royalty deals with artists and composers. So, how to get around the problem of no family plan? Apart from setting up different subscriptions for everyone — which isn’t cheap — you and your partner might share an account and have a phone each, so the three-device limit can work well if you sync tracks to your phones for offline listening. If you have one child, then she could use Offline mode on her own phone or computer, but unfortunately, that means your desktop application on any shared family computer isn’t allowed to sync any tracks for offline listening because it goes beyond the three-device limit. Listening to music through tinny handset speakers that are even tinnier than the ones on your laptop is certainly not what the artist intended! And if you’re listening to files that are meant to be streaming in high quality, then why not make the most of it? At the very least, your personal earphones sound better than the speakers emanating from your phone. Just plug them in, and you’re ready to go.